Any game set in any approximation of Central Asia is going to feature some version of shamanism, the indigenous religion of central and northern Asia. As I've discussed before, I'd rather avoid any attempt to directly mirror the actual religious practices of the Shamanist and Tengrist faiths; both are living religions, and deserve to be treated seriously, rather than having their beliefs travestied in some fantasy game. 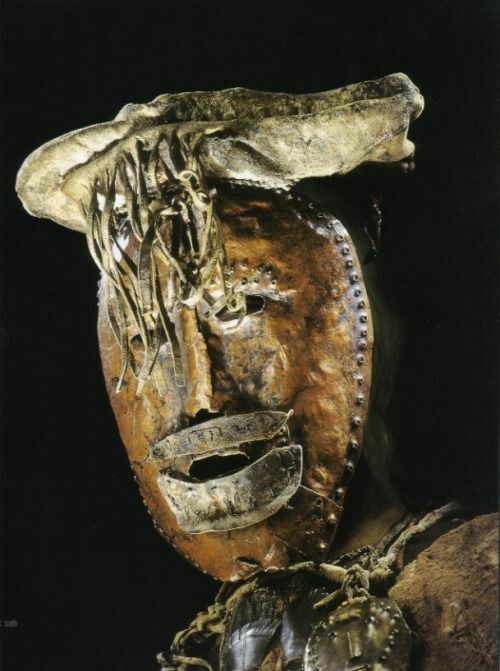 That said, the core ideas behind shamanism - that the world is full of (usually) invisible spirits, that a suitably-qualified shaman can make contact with them by entering into a ritual trance state, and that these spirits can be bribed or placated through homage and offerings - are eminently gameable. I've already written about the spirit world in general, and how non-shaman characters can attempt to interact with it; but for those who want to go a bit deeper, here's a character class for shaman PCs. 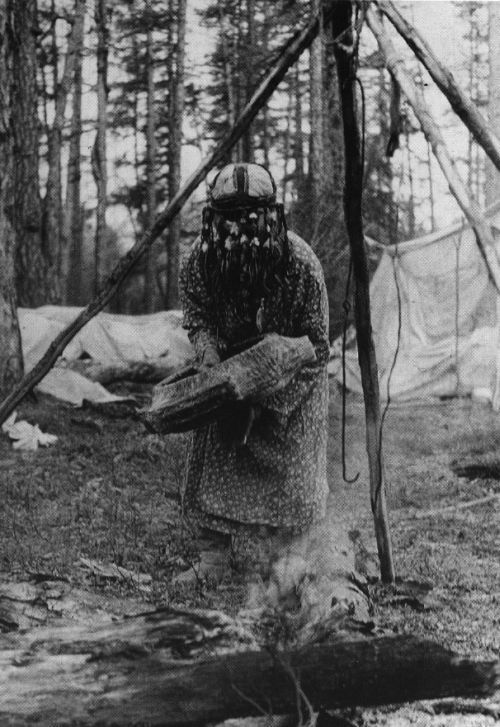 Ritual mask of an Evenk shaman. A shaman is an individual who, through some combination of natural talent and gruelling training, has learned how to project their spirit into the spirit world and commune with the beings that inhabit it. Their job is to act as mediators between their people and the spirits. If the hunting is going poorly, they try to persuade the animal spirits to send their tribe a bit more game. If someone has fallen sick, they try to bribe or threaten the disease spirits into leaving their body. If an enemy army is descending upon the tribe's position, they might beg the wind spirits to bog them down with storms and bad weather while the shaman and her people slip away. Spirits are weird and inhuman, and from a mortal's perspective their demands can often seem capricious and arbitrary, so there's no guarantee of success; but a skilled shaman will be a master of the art of spirit-manipulation, knowing just how to wheedle and flatter them into doing what is necessary for the good of the clan. The shamanic gift of entering the spirit world in a trance state is primarily used for communicating with spirits, but it has other potential uses as well. In the spirit world, the shaman's spirit can change its shape, flying many miles in the form of a bird to spy upon distant events; it can whisper into the minds of others, and even step into their dreams. The most ambitious shamans can turn their gifts to even higher ends, attempting great vision-quests to the furthest reaches of the spirit world in search of wisdom, enlightenment, or communion with the great god(s) themselves. The spirit world is vast and confusing, and many of its inhabitants are not what they seem; many a shaman has believed themselves to be communicating with the Soul of the World, when in fact they have simply been misled by some petty lying spirit which has bamboozled them with glib illusions. For a shaman of sufficient wisdom and experience, however, it is navigable, even if the contents of its higher realms are likely to be beyond the scope of most games! 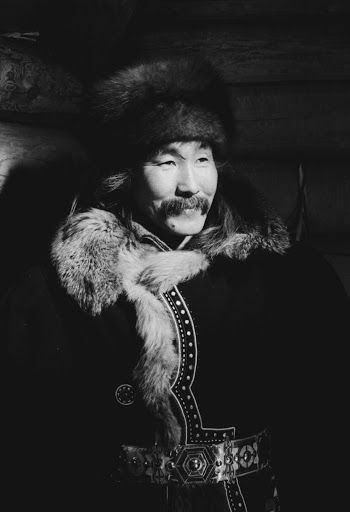 Yakut shaman in full ritual regalia. You are proficient with all simple weapons, with bows, and with light shields. You cannot use heavy shields, or any armour heavier than heavy leather (AC +3). You get 1d6 HP per level. You gain a bonus to all attack rolls equal to one-half of your level, rounded down. You can intuitively sense whenever there are spirits nearby which want to communicate with humans, although actually interacting with them requires you to enter into a trance state (see below). By spending an hour or so singing, dancing, and drumming, you may enter a trance-state in which you may communicate with the spirit world, as discussed here. If you are in your ritual regalia (outfit, mask, drum), then success is automatic; if you don't, perhaps because they've been taken from you, then you must make a Wisdom roll to succeed, with failure meaning that you must sing and dance for another 1d6 hours before trying again. You are an expert at flattering, persuading, and haggling with spirits. If you can't or don't want to give them what they actually want in exchange for their aid, then you may be able to get them to accept an inferior substitute instead; so a bloodthirsty ghost which is demanding a human sacrifice might be fobbed off with a sheep instead, while a proud spirit that wants a temple built for it might be persuaded to settle for a simple roadside shrine. Your basic percentile chance of persuading a spirit to settle for less is equal to 30 + your charisma score + five times your shaman level. The GM may impose modifiers on this roll depending on just how close your offering actually is to what was originally asked for - getting a spirit to accept a sacrificial chicken instead of a human is much harder than getting them to accept a horse! If someone is sick or injured, then by spending 1d6 hours singing over their body you may call healing spirits to aid them. If they are suffering from poison or disease, they get a new saving throw; if hurt, they recover a number of HP equal to your shaman level. Each person can only benefit from this ability once per day. While in a trace-state, you can project your spirit out of your body in the shape of a bird, fox, or other swift-moving animal. In this shape your spirit can travel at 10 + (5 x level) mph, and can travel a maximum distance from your body equal to one hundred times your level in miles: so a level 5 shaman can spirit-travel at 35mph up to 500 miles away, while a level 7 shaman can travel at 45mph for up to 700 miles. Within the spirit-world, your spirit-body has Strength, Dexterity, and Constitution equal to your Charisma, Intelligence, and Wisdom, respectively. Wherever you go you will be able to perceive the local spirits (and other shamans in trace-states), and you will also get a vague, hazy understanding of what is happening in that place in the physical world; so you would know if an army was passing through your spirit's current location, but wouldn't be able to discern their weapons or insignias, and would have only a very vague idea of their numbers. You are immediately aware if your body is injured, and may make a WILL save to instantly snap back to your body; if you fail you take 1d6 damage from psychic feedback, but may try again next round. If you spirit-travel to the location of someone you know well, you will be aware of the presence of their spirit and may try to communicate with it. This is easiest if they are asleep: in this case you simply appear in their dreams (in spirit-animal form, naturally) and tell them whatever you want to say, which they will automatically remember when they wake up. (If they don't want you in their dreams, they can force you out by making a successful WILL save, preventing you from making any further dream-communications that night.) If they are awake you can try to whisper to their soul, but unless they are also a trained shaman they may well fail to hear you. They must make a Wisdom roll: if they pass they experience a brief vision of you in spirit-animal form passing on your message, but if they fail then they just feel kinda weird for a few seconds and you are unable to try communicating with them again for 1d12 hours. Starting equipment: Heavy leather and fur garments (+3 AC), ritual regalia consisting of a mask, drum, and decorated leather costume (+1 AC when worn), bow (1d8 damage), hatchet (1d6 damage), 2d6 bags and pouches containing various offerings for spirits (berries, dried meat, etc), 2d6x10 sp. Left alone for long enough, pine trees can easily grow to be over 150 feet tall. Take a look at that photo: a landscape of giant pines is one in which anything human-scale is going to feel like an insect, crawling between the feet of giants. Out in the deep taiga, where the pines go on forever in all directions and tower a hundred feet above your head and are so huge and so heavy that any one of them would crush you to jelly if it fell on you, it's natural to not really feel entirely comfortable. In the giant pinewoods, no human traveller can ever truly feel at home. 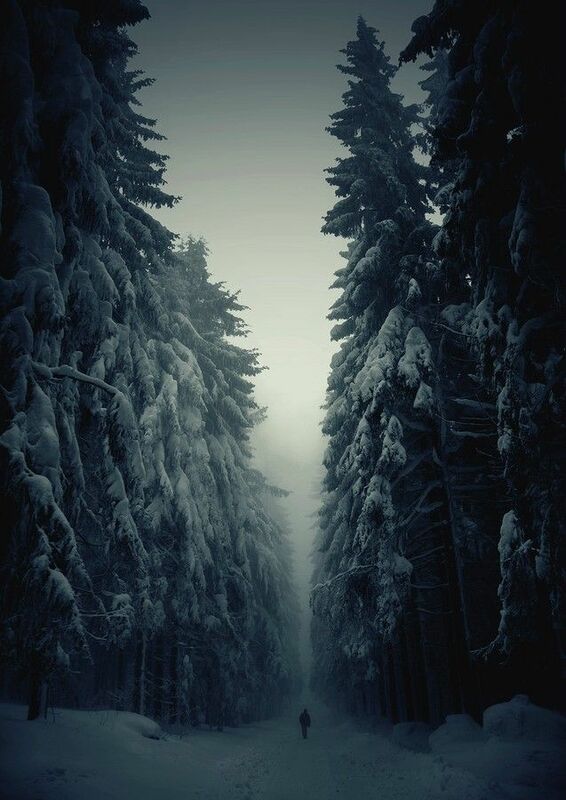 These woods are inhabited by the Children of the Pines: a strange race of silent, snow-faced men and women who creak softly when they move, and bleed sweep sap instead of blood. Their legends claim that their earliest ancestors were a band of siblings, three brothers and three sisters, driven from their homes by a cruel queen who hated them for their great beauty; they wandered north until they came to the pinewoods, where the spirits of the pines saw them, and fell in love, and took them as their husbands and their wives. Now their descendants dwell amongst the conifers, living in hide tents or log cabins between the great trees, or in precarious-seeming treehouses raised fifty or sixty or seventy feet above the forest floor. They are skilled hunters, great wood-carvers, and magnificent climbers. They never seem to feel the cold. A Child of the Pines, somewhere in the deep taiga. Thematically, the Children of the Pines are the counterpoint to the Children of the Sun. Just as the Children of the Sun are emanations of the southern deserts, and the primarily monotheistic religions which flourish there, so the Children of the Pines emerge from the boreal wildernesses of the north, where the animistic spirit-religions hold sway. The Children of the Sun know that this world is not their true home; they come from something higher and purer, and insist on holding the world to the same standards, driving always towards perfection. The Children of the Pines accept that the world is just the world: they live in it, but they have no special longing to change it for the better. The Children of the Sun live by truth and righteousness. The Children of the Pines just... live. They seldom emerge from their pinewoods, save when the great spirits of the north lay some task upon them, or when they commit some crime amongst their own people that leads to them being driven forth into the world outside. They are regarded with superstitious dread by the inhabitants of the taiga, who view them as being closer to spirits than mortals; if some band of nomads or hunters chance across one, they will treat them with extreme caution and courtesy, while one of them runs off to fetch a shaman who will know how to deal safely with such an unusual visitor. Further south, in the steppe or the desert, they are mere curiosities, freakish beings far from home. They grow uneasy in open spaces. They will never feel comfortable without a pine canopy above their heads. And so they shoulder their bows, these snow-faced, sap-blooded dreamers, and they climb onto the backs of their reindeer mounts and set off on the long, long journey to the Wicked City. They will not rest until her bones lie once more in her tomb of carven pinewood, deep amidst the snows of the north. You must have Constitution and Wisdom 12 or higher. You are proficient with simple weapons, with bows, and with armour no heavier than heavy furs (+3 AC). You are not proficient with shields. You gain a bonus to all your to-hit rolls equal to half your level, rounded up. You gain 1d6 HP per level. You aren't immune to the cold, but your cold tolerance is very high: you could sleep outdoors in a blizzard and only be moderately uncomfortable. Any cold damage you take is halved, rounding any fractions down. Only half your nourishment comes from food; the other half comes from photosynthesis. On the plus side, this means you only need half as much food as other people. On the minus side, it means that if you're deprived of sunlight for too long you'll feel weak and listless, regardless of how much food you eat. Being completely deprived of sunlight for weeks on end will make you very, very ill. When cut, you bleed thick, sweet sap, which rapidly hardens into resin and seals the wound. Effects that cause continual damage from bleeding will not affect you. Your sap also has extremely potent antiseptic, antibacterial, and anti-inflammatory properties, and can be used for sealing other people's wounds as easily as your own. By cutting yourself and bleeding 1 HP worth of sap into someone else's open wounds, you can heal them for 1 HP. You can do this as many times as they have wounds to treat. For obvious reasons, this doesn't work on other Children of the Pines. You are closely attuned to the spirit world. You can automatically enter a trance-state at will just by meditating for 2d10 minutes, and your percentage chance of identifying evil spirits is equal to three times your combined Intelligence and Wisdom score. You are an absolutely amazing climber. If something could possibly be climbed by a human, then you can climb it, no rolls required. You also have incredible natural balance, and can walk across branches, tightropes, and so on without needing to worry about falling unless you are actually pushed. You can talk to trees, by making weird creaking noises at them and then listening to the creaking noises they make in return. Trees are much more aware of their surroundings than they like to let on, but their awareness is all vibrational; they can tell a man from a horse by the vibrations of their tread on the earth, and tell a shout from a whisper by the vibrations they leave in the air, but visual details like colour mean nothing to them. Their language is also very, very slow, requiring a whole minute to communicate a single word. Each species also has its own dialect: you are fluent in the language of the coniferous trees, but the deciduous speech confuses you, taking twice as long to comprehend and imposing a 30% chance of misunderstanding on each communication. You smell of pine resin. This is far cooler than smelling of sweat like everyone else, but it does make you rather easy to track by scent whenever you're not in a wood! Starting equipment: Animal hide clothing (+2 AC), spear (1d6 damage), longbow (1d8 damage), traps and snares for animals, tame reindeer for riding (replaces normal riding horse), set of wood-carving knives, 2d6 decorative amulets and trinkets carved from pinewood, pine-fresh scent, 1d6x10 sp. PC/NPC Romances: From Liability to Asset! As I've mentioned before, one reason why a lot of D&D players are reluctant to get their characters involved in any kind of romantic relationship is that they've had bad experiences in the past: of GMs killing off the loved ones of PCs as a way of generating some cheap drama, or using them to manipulate reluctant characters into following the plot. As a teenager, I was guilty of this myself: character has a family? Have them kidnapped by the villain: they they have to go after him! Character has a love interest? Have them killed by the baddies to show they're serious! Unsurprisingly, after a few experiences of this kind most players start insisting that all their PCs are orphans with no living relatives, who are either totally asexual or are interested in only the most transitory of casual relationships. After all, if you have no loved ones then they can't be used against you. I have no need for friendship! Friendship causes pain! I touch no-one and no-one touches meeeeeee! I am a rock! I am an iiiiiiisland! In ATWC, I want to do the opposite: to ensure that, in all but exceptional circumstances, having someone out there who you really love and care about, and who really loves and cares about you, is a major asset, rather than a liability. Furthermore, in keeping with the overall themes of the game (and the romantic fantasy genre), I'd like to concentrate on all the ways in which this can be true beyond the rather tiresome 'they're just as good at fighting as you are!' option. PCs should follow their hearts, rather than worrying whether the person they're romancing has enough hit points to provide a meaningful advantage on the battlefield! Let's say you've shacked up with someone 'ordinary', like a farmer or shopkeeper: he's a nice guy, you get on well with his family, but he's not going to be slaying monsters any time soon. Does that mean that he (and they) aren't useful to you? Not at all! While you're off questing in the wilderness, they can look after your business interests, keep their eyes and ears open for information, put the word out that you're looking for someone or something important, stand up for you and your reputation while you're not around to do it yourself, and generally do the kind of social legwork that you only really appreciate when you discover just how difficult life can be without it. When you finally get back, you can look forward to finding a hot meal, a hero's welcome, and a wealth of support and information waiting for you, rather than just having to slope off to a hired room and hope that the guys you paid to look after your stuff didn't decide to run off with it while you were away. Captured by pig-men? As you languish in your filthy cell, you can at least be sure that there's someone out there who will be doing everything within their power to find out what's become of you, and to bring you safely home again. Even if they're in no position to be riding off to rescue you themselves, they can and will throw all the resources they have at gathering information, organising rescue missions, guilt-tripping your old friends and colleagues into looking for you, and generally ensuring that you're not simply permitted to drop quietly off the face of the earth. If someone with no connections vanishes, then virtually no-one is going to notice; but you have someone who will not shut up about you, and whom you can rely upon to continually bring your case to the attention of anyone who might be able to help until you're either saved or dead. And if you do die, they'll just shift to trying to get someone to avenge you. Isn't that a comforting thought to take with you into the dungeons? Genuine emotional intimacy dissolves people's boundaries and barriers like nobody's business, and after just a comparatively short time spent living with your new love interest, you'll probably realise that they've acquired a shocking level of insight into how your mind really works. That means they know when you need supporting and encouraging, and when you need dissuading; they can sense when you're really onto something, and spot when you're about to make a huge mistake. In game terms, assume that any major project your character undertakes - starting a business venture, planning an expedition, researching some obscure fact - is going to be substantially more efficient and effective for as long as their significant other is around to help. Again, this doesn't require the SO to have any relevant specialist skills: they're helpful not because of how well they know the thing you're working on, but because of how well they know you. They might not know the first thing about building a giant robot battlesuit, but they will know exactly when they should bring you an extra pot of coffee, and when they should tell you to put down the gears and get some damn sleep already instead: and as a result, the project will go much more smoothly than it ever could have done without them. They also remember exactly where you're always leaving those things you keep thinking that you've lost. That alone probably improves your efficiency by at least 10%. Whether it's the kind of grand romance where you would do absolutely anything for one another, or a slightly more down-to-earth affair where you just really enjoy being together and would really rather not die until you've had the chance to do a whole lot more of it, your relationship gives you something - someone - to care about and cling to in an often confusing and hostile world. This probably makes you reluctant to throw your life away in the name of some grand abstraction - there's a reason why unattached young men are always the ones who get used as cannon fodder - but it also gives you a hell of a motivation to make it back alive. GMs might want to consider granting bonuses to applicable FORT or WILL saves, or even allowing characters to survive unconscious for a couple more HP than would normally be the case, to represent the tenacity with which characters will cling to life when they have someone that they really can't bear to leave behind. He knows a thousand stories. One or two of them might even be true. Ynas pointed out that I'd done these tables for Fighters, Scholars, and Tricksters, but not for Travellers. This is because I started writing a list of twenty traveller's tales, of the 'You'll never believe what we saw when we were out in the deepwoods one summer' variety, but I found them much harder to come up with than the other three lists: I ended up stalling at thirteen. So now I'm just gonna cut it down to a 1d12 table and be done with it. Mountaineer's gear: Layers and layers of heavy clothing (treat as heavy leathers, +3 AC), climbing pick (1d6 damage), musket (1d10 damage, 3 rounds to reload - may replace with longbow if proficient), 50' rope with grappling hook, climbing spikes with hammer, sure-footed pack mule, 1d6x10 sp. Huntsman's gear: Heavy leathers (+3 AC), hatchet (1d6 damage), musket (1d10 damage, 3 rounds to reload - may replace with longbow if proficient), 30' rope, animal snares and skinning knives, bag of dried healing herbs, large and faithful dog, 3d6x10 sp. Horseman's gear: Weatherproof buff jacket (+2 AC), two pistols (1d8 damage, 3 rounds to reload), sword (only if proficient), sturdy riding horse (in addition to the regular horse everyone starts with), saddle and bridle, 1d6x10 sp. Caver's gear: Light leather coat (+1 AC), light crossbow (1d6 damage, 1 round to reload - may replace with shortbow if proficient), climbing pick (1d6 damage), 50' rope with grappling hook, climbing spikes with hammer, set of chimes used by the Deep Folk to signal one another underground, spare lantern, 2d6x10 sp. Boatman's gear: Buff jacket (+2 AC), hatchet (1d6 damage - may replace with sword if proficient), musket (1d10 damage, 3 rounds to reload), compass, spyglass, 3d6x10 sp. Airshipman's gear: Windproof buff jacket (+2 AC), crossbow (1d8 damage, 2 rounds to reload- may replace with longbow if proficient), mechanical repair kit, flask of lighter-than-air gas (wrapped in lead weights to stop it from floating away), homemade 'rosary' made from hundreds of lucky charms, 2d6x10 sp. 3. When you were young, you were caught in a terrible shipwreck; you would have died if you hadn’t been rescued by a girl with skin the colour of river-water, who dragged you out of the river and onto the shore. Sometimes you even wonder if you didn’t hallucinate the whole thing. But every night you see her in your dreams; and some day, somehow, you will find a way to repay her.